I woke up this morning, and for some reason or another, started looking for estate sales on craigslist in the hopes of seeing something interesting for sale. I stumbled upon one in particular that had a vague description about a camera collection just on the other side of town. I scrolled through some of the photos they had posted and noticed what looked to be a SX-70 case beside some junky 35mm cameras. Oh ya. That’s the winner. I had about an hour to get there so I grabbed an empty film pack to test it and ran out the door. Hit a good amount of traffic on the way but managed to get there with about 10 minutes to spare. As I approached the house, I noticed a good amount of people outside .. probably 40+. Everyone was waiting in a line and a few were gathered underneath a tree in the yard. Hmmmm … haha. I had to do something to get inside and get to that camera first. After a little while, I saw a few people looking through the front windows. I moseyed my way up to the porch fake-texting on my phone and reached the front of the house. Typically, I would not condone this type of behavior BUT in this circumstance .. I figured it was probably OK. 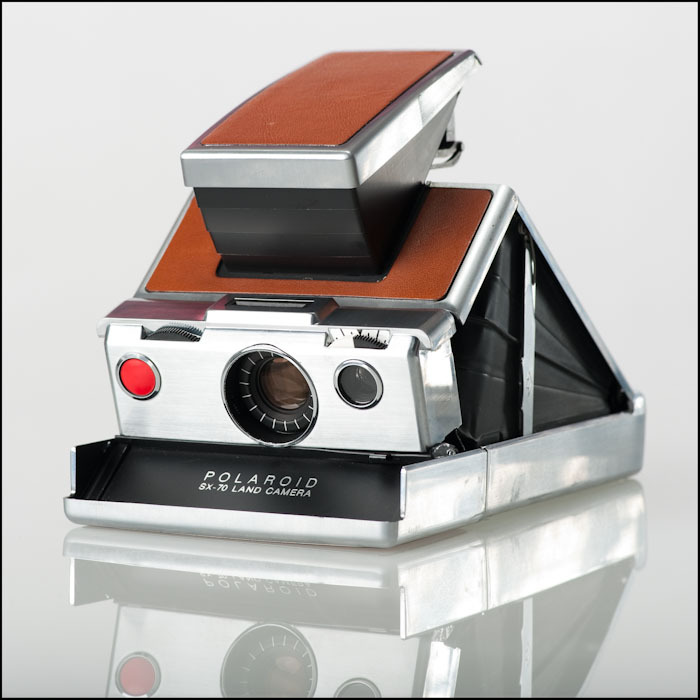 I peeked in the window and saw a pristine Polaroid case sitting on a table along with a few other cameras. The door opened up and I heard “OK – We are going to take the first 30 people …” Well .. I did come all this way for the camera. I snuck inside and went directly to it, pulled it out of the case just a little bit (pristine condition), noticed the sticker price ($70) and I went to the front to pay. “You sure were on a mission weren’t you? ?” The lady said .. haha. On my way out the door I hear a few people asking where the cameras were .. sorry guys. Once I got to the car, I put an empty pack of film in the camera and knocked off a few exposures. It sounded great! Happy with the new acquisition I cruised back home. Once I got there, I started fiddling with it again and then noticed, the whirring noise it was making when doing its ejecting business, was sounding a little strained. I pulled the pack out and put it back in and the whirring started … but then the motor kept running. 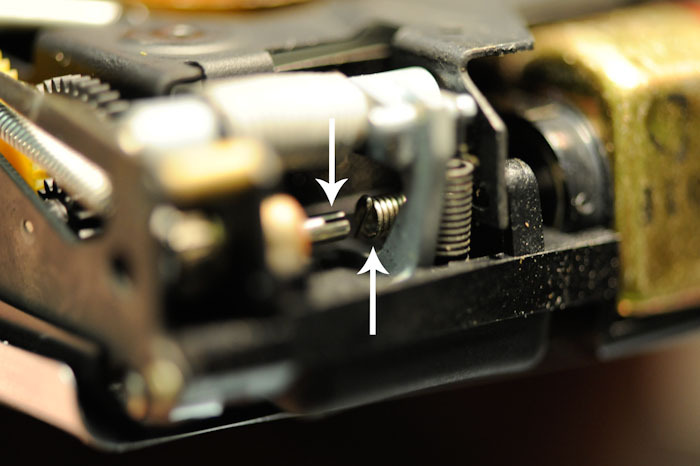 The mechanism that spits out the dark slide & photos was not working .. haha. NooooooOOOOoOo! I just got this thing … I took the pack out and searched online for a fix. Connect the inner spring to the spindle. You will need to stretch the spring out and work with it until it can clip in the spindle. 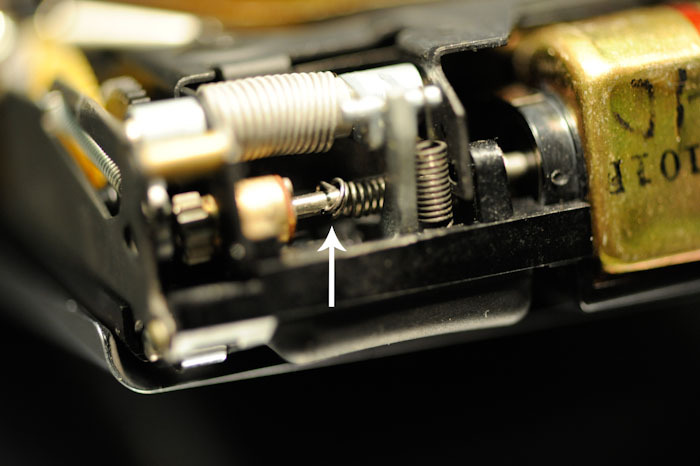 Replace the spring you took off earlier, put the cover back on and then you’re all set! It looks to be working fine! Can’t wait to shoot the rest of this pack over the next day or so ..
Should it slide or you have to press something at the same time? If you get any idea, it will be helpfull!! 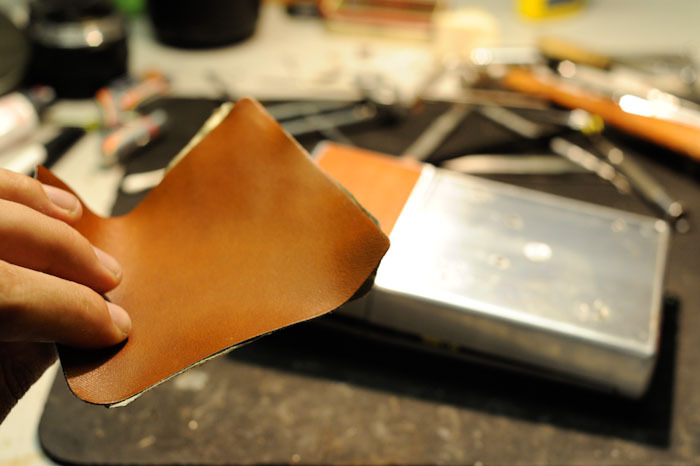 PS: its the sx first model with brown really leather. You just have to pull it straight back and a little up while pulling. It will take a little bit of force but it should slide right out. It moves about an inch back and then you can lift it out of the way. Darn, if I am not having the same issue… Unless I have lost my man hands… Its just not wanting to give. 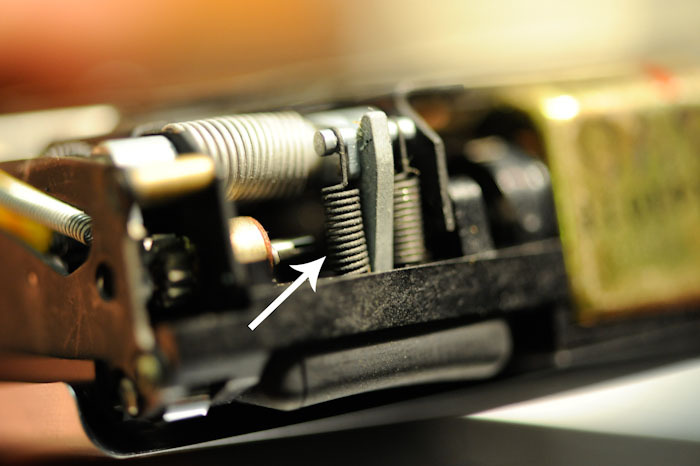 There’s a button on the side that moves a latch that releases the front so it swings downward to insert the film cartridge. Are you sure the button & latch are functioning correctly? It sounds like they might not be. Yes, The main door opens and closes properly, and the camera folds without a gap. The issue here is the door that acts as a film shade, covering the rollers. It stays down after the camera is unfolded. When I pull the sides of the main door outward, it then springs back up covering the rollers. But it is supposed to do so automatically when the camera is unfolded. Are you sure it’s t-5? i just spent $15 on a torx screw driver set from your recommendation and the 5 is too big…. pretty annoyed. Thank you so much for sharing this! You’re the man! It took me and my girlfriend over 2.5 hours to fix it, but it finally worked. 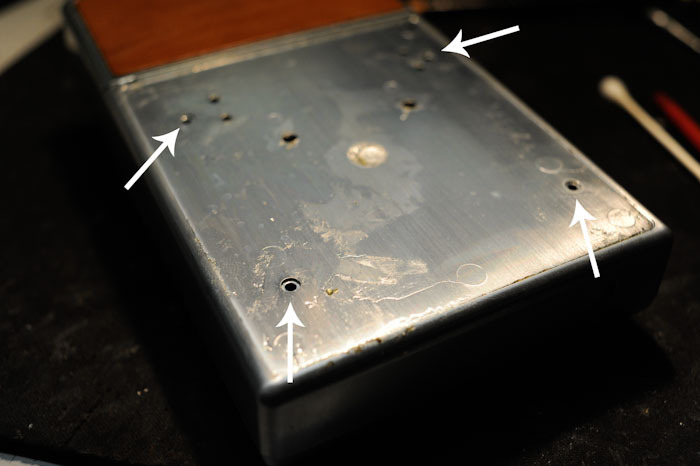 I could not remove the cover by sliding, so i used a screwdriver to force push it, which left some visible scratches 😦 When I tried to pull the inner spring, i pulled to hard and it fell off completely. After 30min, with the help of a hairgrip, we managed to push/pull it back to its origin place. After stretching it carefully, it was long enough to fit into the spindle. I took only 5 pictures since the repair, but so far no more problems with endless whirring. Thanks again! I just want to thank you for making this post! I recently found an alpha 1 in amazing condition in my grandfather’s closet, I took it to a local camera shop to test it out only to find out wouldn’t stop cycling. The man at the shop told me I would be better off buying a refurbished one rather than paying someone to take it apart, find out what’s wrong, and repair it. I started doing more research into the problem and came upon this article. Last night I took it apart and followed your instructions and this morning I took it back into that shop and tested it out again. It worked! So I bought a pack of film and took a couple test shots which seemed to turn out fine, I just have to get used to focusing it better. I can’t wait to take it back and show it to my grandfather! Nice!! Happy it helped you solve the problem. 🙂 thanks for letting me know. This guide legit saved me! 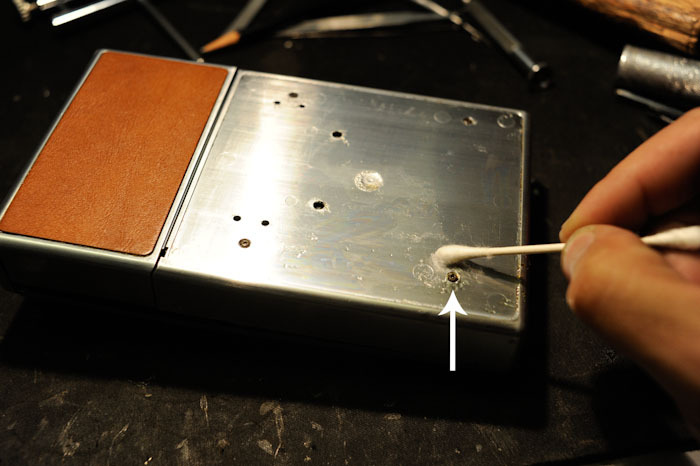 Thank you; just repaired my sx-70 using these steps! 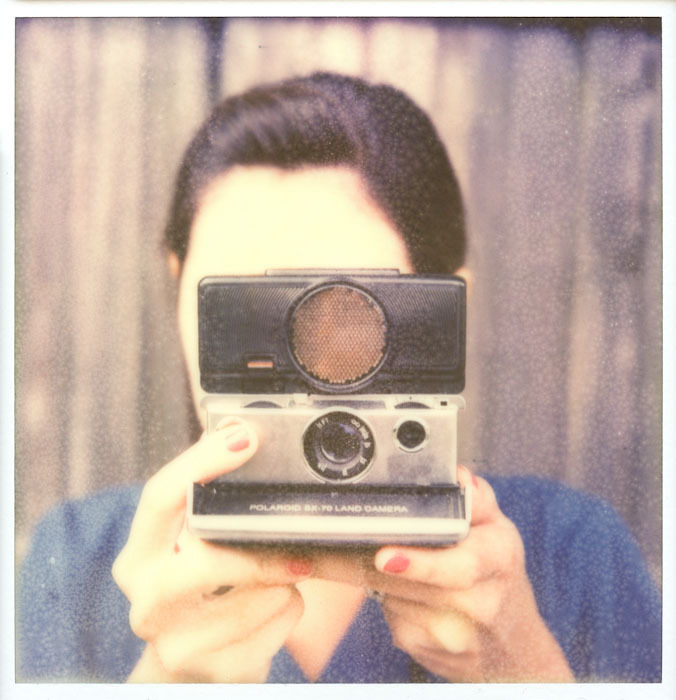 You are currently reading The Dreaded SX-70 Whir at Justin Goode.